Shrimp make the perfect protein for quick and easy weeknight meals. When combined with an simple to make Thai peanut sauce, spaghetti noodles and some crisp vegetables, dinner is on the table in the flash and your family will be oohing and ahhing over all the flavor! 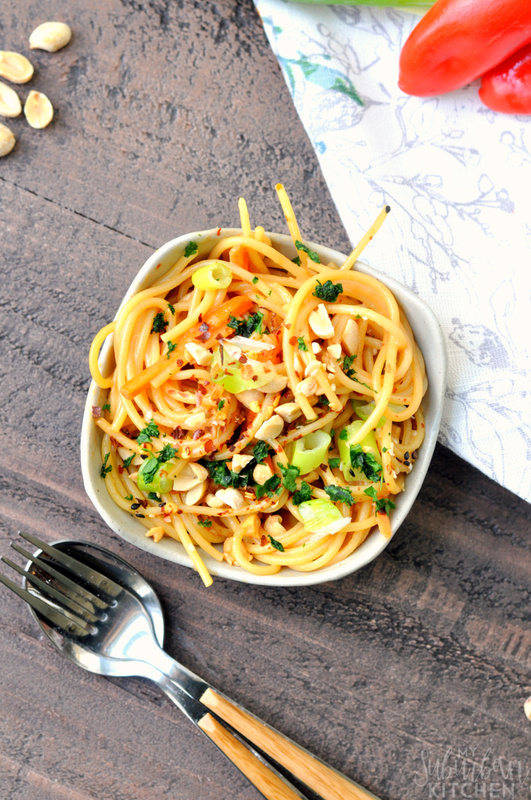 I use a similar sauce on my 15 minute Thai peanut noodles and everyone absolutely loves it. You can play around with the amount of spice you use in the Thai peanut sauce by varying the amount of Sriracha you use. I’ve made this recipe with and without the noodles and both are really good. If you are trying to cut down on your carbs or just really short on time, you can skip the noodles without sacrificing a lot of flavor. I would just recommend doubling the cabbage and bell peppers. 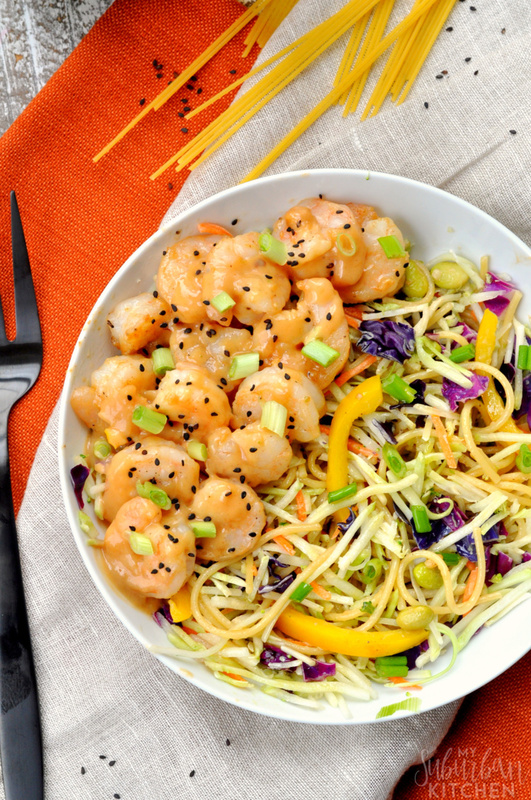 For the cabbage, I typically use just a tri-color coleslaw mixture without the dressing because it is already pre-cut and makes this Thai peanut shrimp bowl even faster to get to the table. You can, of course, chop your own cabbage and, if you do, I recommend using a mixture of napa and purple cabbage. If you make this Thai peanut shrimp bowl or any other recipe for the blog, I’d love to know about. Let me know in the comment or snap a photo and tag it #MySuburbanKitchen on Instagram or Twitter. 1. In a medium bowl, whisk together sesame oil, soy sauce, rice vinegar, Sriracha, peanut butter and honey. 2. Heat oil in large saute pan. Season shrimp with salt and pepper and add to pan. Cook for 2-3 minutes on each side. Add 2 Tbsp of sauce from step one and stir to combine. Remove from pan. 3. Add bell peppers to saute pan and cook for 1-2 minutes. Remove from pan. 4. 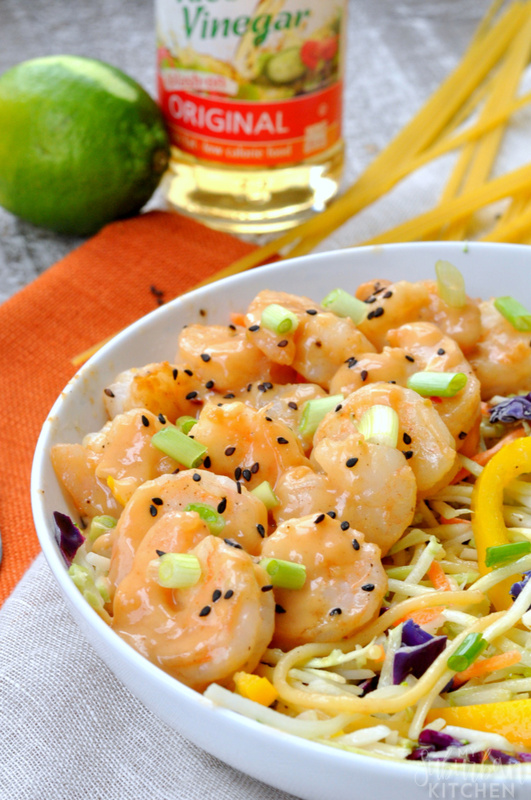 In a large serving bowl, combine spaghetti, cabbage, carrots, bell pepper strips and shrimp. Toss to combine. Drizzle with remaining sauce and serve. - You can adjust the spice level of the sauce by increasing or reducing the Sriracha. - I frequently replace the cabbage and shredded carrots with bagged tri-color coleslaw (without the coleslaw dressing) that can be found in most produce sections. That looks really yummy! Pinned for later to give a whirl! Would love for you to share over at Let’s Party! https://themarkandjanshow.com/2018/02/21/lets-party-9/ … we look forward to seeing you there!